The link on how to measure on the new website is hosed up....they are working on repairing it. In the meantime, I sent you my e-mail address in a PM, Gdog. Please send me an e-mail and I will send you the Weezle sizing chart and directions. Hi! I just returned last night from deer hunting over in Idaho and didn't see this until this morning! I sent you a PM, gdog! Gdog wrote: Anyone know how to get ahold of John? Anyone know how to get ahold of John? I'm so Happy that you are getting a Weezle Extreme Plus!!!! I love mine!!! Just a note - Christmas is just around the corner! If you want to give or GET a Weezle this year, remember that the closer we get to December 25th the bigger the back-up runs at US Customs for shipments coming in from the UK! I currently receive Weezle shipments within 2 weeks, so let me know if you wish to place an order! Notice: I have updated the first post to reflect the new pricing. Scubie Doo wrote: I just bought an Extreme + and this is, by far, the warmest undergarment I have ever used. I have dove with several undergarments (including 4th Element Arctic, DUI, USIA, Weezle Extreme) and I have never been more comfortable than I have with the Weezle Extreme +. All I wear underneath is a wool base layer. Also, I did not have to add any weight with the change to Extreme + and my suit vents perfectly fine. Those are (2) myths about the Extreme +. Thanks for making my dives way more comfortable Mr. Rawlings! Thanks for the kind plug! Every now and then I come across someone that *heard* Weezles have a venting problem. When I ask them it is always the old story of how they heard from *someone* who *knew a guy* that had heard a story about *someone else* that had a problem years ago.... People that actually dive with Weezles just shake their heads. Last edited by ScubaJess on Sun Apr 19, 2015 7:36 am, edited 1 time in total. I just bought an Extreme + and this is, by far, the warmest undergarment I have ever used. I have dove with several undergarments (including 4th Element Arctic, DUI, USIA, Weezle Extreme) and I have never been more comfortable than I have with the Weezle Extreme +. All I wear underneath is a wool base layer. Also, I did not have to add any weight with the change to Extreme + and my suit vents perfectly fine. Those are (2) myths about the Extreme +. Thanks for making my dives way more comfortable Mr. Rawlings! I just received an e-mail from Weezle announcing that their prices are going up. I'll have to change my prices when theirs go up. Any orders that they receive before the last day of April will be at current prices, after that date they will be higher. Jan K wrote: I got to bump Weezle Drysuit Undergarments post. I got wet today, and as you know, we got some cold spell upon us. 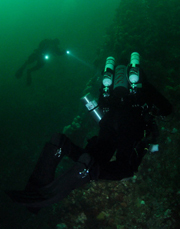 I stayed warm in spite of leaky drysuit, and believe me, my old bones don't tolerate cold ! Jan, Are you diving the extreme or extreme plus? Considering one of these and not sure which one. Seems like a plus under a shell suit would be a good choice. Thanks John! Another super nice guy named John is letting me borrow his wifes. I'm sure I will fall in love with it, so then I can order one from you when I get back. Thanks for your help! Nope....afraid not. You sure could use it up there with all the diving you're going to do! Lately, I've been getting the Weezles about 1 to 1 and 1/2 weeks after I order them from the UK. The order I just received yesterday arrived in LESS than a week, but that's unusual. Do you happen to have any Womens Small Weezle Extreme Plus hannging around? I'm going to Gods Pocket next week , so it's way too short notice to order one in. Thanks for the endorsement, Jan! I got to bump Weezle Drysuit Undergarments post. John Rawlings wrote: Christmas is coming up (Egad! ), so I figured that I'd better encourage some advanced planning out there for anyone wanting to give or receive a Weezle! The last couple weeks of December are hectic with US Customs since so many millions of products are streaming through into the United States, so it can sometimes take a wee bit longer for Weezles to arrive here after you order. Please plan ahead so that your Weezle will be safely wrapped and under the tree on Christmas morning! I never ask for payment until your Weezle arrives here from the UK and I either personally place it in your hands or ship it to you by Priority Mail. For information on Weezle products, as well as measuring and ordering, please refer to the very first post in this thread. Continuing with the Christmas and Holiday ordering heads-up. My last order took 8 days to get here from the UK, and as the overall amount of goods coming through US Customs increases this will probably slow down. If you are thinking of giving or getting a Weezle, please plan ahead so that it arrives in time. I'm planning on getting one (extreme plus), but I just not sure on my size. I might be a Med Long or a Large, but will have to measure again tonight as I forgot. Anyone have one of those sizes that I can try on? Cool....just let me know when you're ready to go on it! Is there anyone out there With a Weezle in his size that can help him out? If not, always remember that since Weezles do not stretch it's far better to have one slightly too large than one that is slightly too small. There are a lot of Weezle divers living on the Eastside - hopefully there is one in your size willing to let you try theirs on! Christmas is coming up (Egad! ), so I figured that I'd better encourage some advanced planning out there for anyone wanting to give or receive a Weezle! The last couple weeks of December are hectic with US Customs since so many millions of products are streaming through into the United States, so it can sometimes take a wee bit longer for Weezles to arrive here after you order. Please plan ahead so that your Weezle will be safely wrapped and under the tree on Christmas morning! Just a quick post. I dove with the cove 2 wednesday guys after receiving my weezle extreme. Had to do a weight check and all of that since this was my first dive in about 2-3 years. Had some complications, my suit pretty much flooded. Thankfully I stayed warm, the entire time I was pretty much compressed with very little extra air. When finally feeling the full extent of my suit filling up (and being soaked from head to toe) I added a bit of air to warm up (not much). The dive was cut short due to a leaky inflator so my entire dive was only 34ish minutes not counting water bobbing time. At the end my hands were only a little bit cold. When I took off my suit, about a gallon of water poured out. some sleeves, most legs. Still warm, and weezle extreme soaked. I think this pretty much sold me on weezles, and if you know me, I'm not easily pleased. Plus 1 gazillion for weezles.